Marines looking to expand their leadership skills beyond their current jobs have the opportunity to accept the challenge of a rigorous three-week course that will enable them to train the next generation at the Marine Corps Martial Arts Training Facility aboard Marine Corps Recruit Depot San Diego. 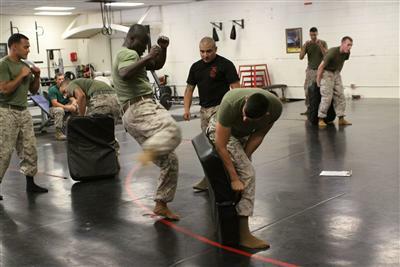 Twenty-one Marines from MCRD, Marine Corps Base Camp Pendleton, Marine Corps Air Station Miramar, and Naval Amphibious Base Coronado are participating in the Martial Arts Instructor course which will allow them to train and test other Marines looking to earn higher belt levels in MCMAP. MAI course students are expected to arrive ready to train. From 6:30 a.m. to 5 p.m., Marines push their limits both physically and mentally. For every physical training event there is an equal amount of classroom work to ensure Marines thoroughly understand the material. In order to become an MAI, Marines need to be corporals or above, have earned at least a grey belt, and have a first class physical fitness test 225 or higher and first class combat fitness test of 270 and higher. They must also have completed the appropriate grade professional military education. Although the class focus’ on green belt and below, Marines with brown or black belts get additional training to ensure they’re prepared to teach up to their belt levels. Marines who begin the course as grey belt will graduate with green belts. “There are a lot of guys in my shop who are still tan and grey belts, I’m a grey belt myself and wanted to get my green. This finally gave me the opportunity,” said Cpl. Blase Barker, air traffic controller, Headquarters and Headquarters Squadron, MCAS Miramar. The Marines learn how to use the “Explain, Demonstrate, Imitate Method” of teaching; explain the MCMAP technique, demonstrate exactly what it’s supposed to look like and break it down by the numbers, showing them how to perform the technique. This proven method breaks each move down “Barney style,” according to Commaito. MCMAP focuses on three synergies; physical, mental and character discipline. Each one is incorporated into the MAI course ensuring a well-rounded and educated warrior. Although physical training is on the forefront of every Marine’s mind, education should be a close second. Throughout the course, students receive different warrior studies and tie-ins used to help understand different cultures helping to increase mental and character discipline. Warrior studies and tie-ins offer Marines the chance to research other cultures’ militaries and understand why certain techniques are used. They also learn how to give these classes and incorporate honor, courage and commitment into them to help make better warriors. “It helps build on their character discipline which is part of the MCMAP program. You learn about previous warfighters and what great things they did which helps builds on your character,” explained Commiato. Students will have to complete two quizzes, two written evaluations and nine practical evaluations in order to become certified MCMAP instructors. The course helps ensure each Marine gets the specialized attention they need to be successful and is designed with safety as a priority, employing one instructor for every 12 students. Being an MAI can help Marines throughout their career in the Corps. Not only will it make them more well-rounded, but it will make them more competitive for promotions, as well as give them the opportunity to get out of their shops and interact with Marines in different military occupational specialties. I think that this is an exemplary service as well as a badge of honor in training the next in line. These hand to hand combat techniques could prove very useful. Can civilian persons (ex-athletes) become MCMAP instructors?